For as long as I can remember, I have wanted to cook in Tuscany. I love the hearty simplicity of Tuscan cuisine, and I dream of the day when I can drop everything and take a few weeks to cook and eat my way across the region. There was a time when I had saved up enough money for a Cortona cooking vacation. I was all set to go when my oldest son woke up one morning, and his teeth looked like he had been chewing on cans. Each tooth had a mind and direction of its own. Not only that, his permanent teeth were growing in faster than his baby teeth fell out. The boy looked like a baby shark. So I did what any responsible mother would do, I begrudgingly used my Italy money to have my son’s jacked up grill repaired. Four years later, my baby has a dazzling smile, and I still haven’t made it to my villa in Cortona for some hands-on cooking instructions. But that’s about to change. It’s time for me to wake up that vacation account lying dormant at the credit union. I will be fifty in two-and-a-half years, and I’m celebrating my half century in somebody’s Tuscan kitchen. I don’t care whose kitchen it it is as long as it’s in Cortona. On the way to the farmers market the other day, I was listening to a passage in Under the Tuscan Sun, and Frances Mayes mentioned a pasta dinner she prepared with eggplant, tomatoes, and basil. That sounded so good to me. 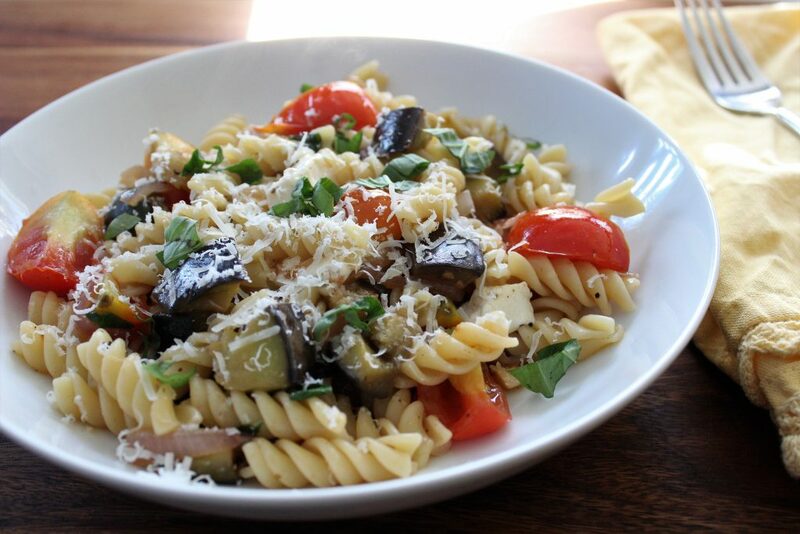 After I finished working for the day, I collected all the ingredients from around the market for my version of the eggplant pasta. In under an hour, I had a pasta dish on the table to rival any Tuscan kitchen, cooked to perfection with fresh local ingredients. It was Cortona in a bowl, and one step closer to my dream vacation. Heat 3 tablespoons oil in a large skillet over medium-high heat. Add the eggplant and season with salt and pepper. Cook until the eggplant is softened and browned, about 6 minutes, stirring frequently. Transfer the eggplant to a bowl, cover with foil, and set aside. Reduce the heat to medium and add the remaining 2 tablespoons oil to the pan. Add the onions and cook until softened, about 3 minutes, stirring frequently. Stir in the garlic and red chili flakes and cook one additional minute. Add the tomatoes and cook until they start to break down and form a sauce, about 3 minutes. Season with salt and pepper. Remove from the heat and keep warm. Add the pasta to the boiling water and cook according to package instructions. Drain and reserve 1 cup pasta cooking liquid. Return the pasta to the pot and add the tomato sauce, eggplant, and pasta water. Cook for 1 minute to heat through, gently toss the pasta to coat with the sauce. Add the mozzarella and basil. Season to taste with salt and pepper if necessary. Transfer the pasta to a platter, sprinkle with grated Romano and serve. 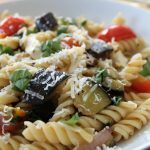 This entry was posted in 30-Minute Meals, Dinner, Entree, Italian, Pasta, Recipes, vegetables pasta, Vegetarian and tagged books on tape, Italian cuisine, pasta, Tuscany on July 16, 2018 by Andria Gaskins.